If you’ve got a messy other half, flatmate or family and you’re particular about cleaning then you’ll love this little gadget. 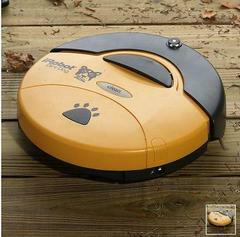 The Indoor Outdoor Roomba Robotic Sweeper is a mini cleaning marvel. It has two hard brushes on its belly, which will scrub your kitchen and living room floor to perfection as they go at 1000 times per minute. It works automatically sweeping away the remnants of lasts night Chinese, dog hair, and well, anything else that ends up on the floor, storing it in its mini dustbin. And you won’t have to worry about paint chipped paintwork, as this cleaning miracle has its own sensor, preventing it from falling down stairs and bashing into walls. Just switch it on and put your feet up. Buy it from Hammacher.